At the outset let me say that cameras are not allowed inside the Dargah, Ajmer. Cell phones are allowed though. I now have a good camera in my phone, the Lumia 1020 so I was excited. I really don’t feel very enthusiastic while visiting places that do not allow photography. This was my third visit to Dargah Sharif but on the last two occasions I was not too thrilled to shoot with my cell phone. 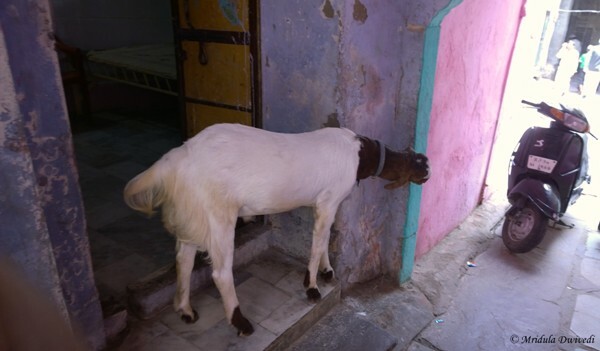 There are actually two ways to go to the dargah. The auto and other vehicles are not allowed on the main road leading to the shrine. Our auto driver took us through the narrow lanes and dropped us near this house. The shrine is just round the corner from this spot. This is the walking road that leads to the shrine. Every time I went there, it was always like this. 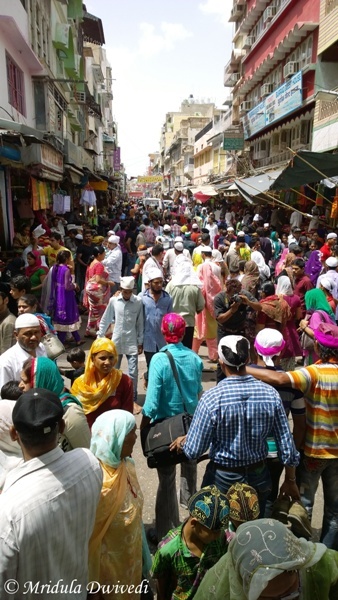 Be it winter or summer there are always the same number of people around the dargah area. 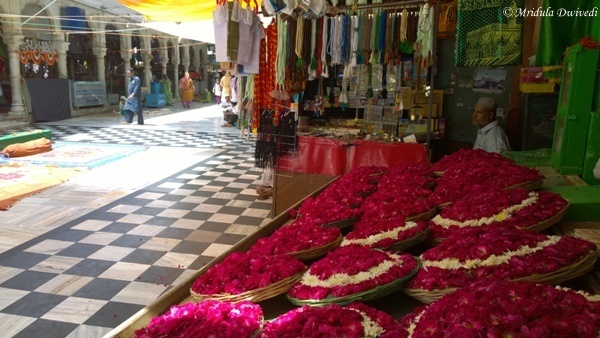 The road leading to the dargah is lined with flower shops. The custom is to offer a chadar and/or flowers. I simply went in and offered my prayers and thanks. 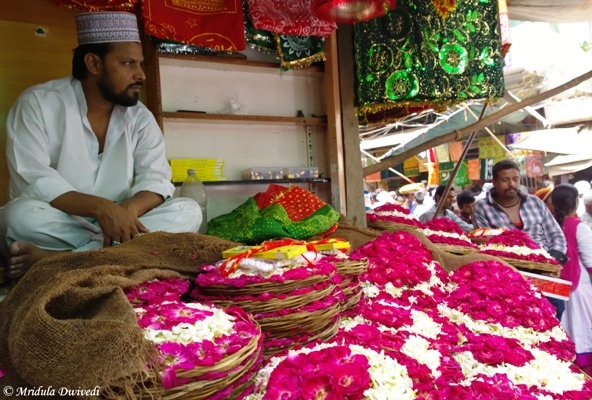 There are chadar and flower shops within the dargah complex as well. I clicked this picture within the shrine when there was a momentary lull. After a while I had to remind myself not to click anymore flowers as in the end I can use only one or two on my blog! This is the main entry point to the shrine. From my first visit I do remember there is a side entrance. You cannot carry even a handbag inside the premises. I was not aware of this on my first visit and I went in looking for a locker. That is when I discovered the side entrance. 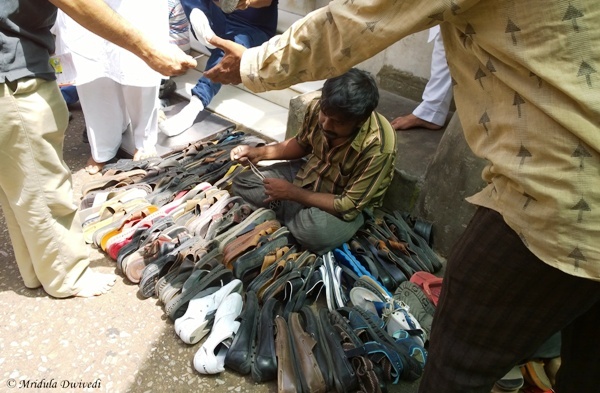 One has to enter the shrine barefoot, there are many places where you can leave your shoes. In May some parts of the floor were really hot, they almost burned my feet. But there were carpets all around, so in the end the feet burning sensation was not too much. Nobody really objects if you use your cell phone camera at the peripheries. I decided to click the water tank. We are supposed to wash our hands before entering the shrine. On the walls of the main shrine people tie a thread when they make a wish (mannat). I think you are supposed to come back and untie it when your wish comes true. 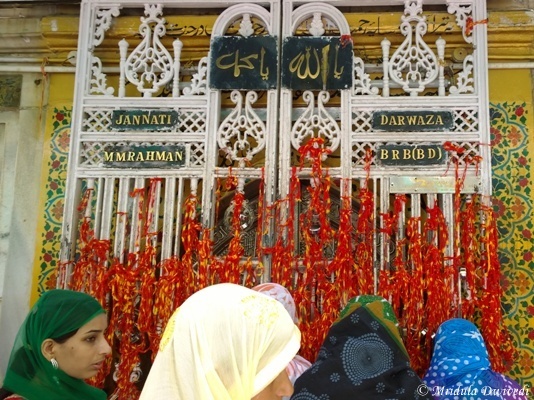 For the believers if you ask for a vajib mannat at dargah sharif they say it will come true. By vajib it is meant that you could not ask for divine assistance for getting someone killed or things like that. I guess your imagination is as good as mine when it comes to making invalid wishes, the ones that baba will not grant. We went in with Syed Mohammed Fakhre Alam Fakhri, he is third from left. 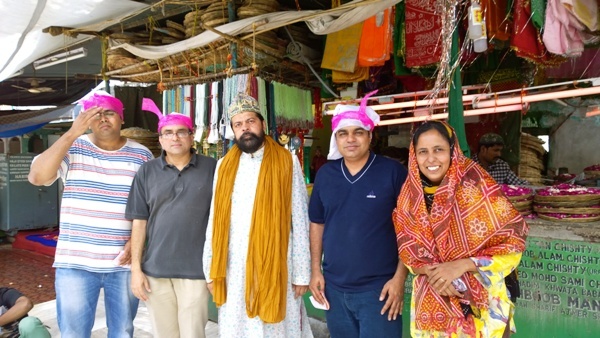 From the picture you can make out that we need to cover our head while visiting the dargah. You can easily go into the shrine on your own. But if you wish to go with a contact I found Alam Bhai quite helpful. He can be reached at 9829187976. I feel quite blessed that I have been called back to the dargah so many times! This time when I visited the Wheeler Bookstore at Ajmer Railway Station the person at the stall said, “lo aa gayen Agatha Christie ki fan!” (Here comes the Agatha Christie fan). In the last two years this was my fourth trip to Ajmer and as I bought Agatha Christie every time from the shop, so the shopkeeper now recognizes me! Surprisingly I have never stayed at Ajmer, I was always there in transit. 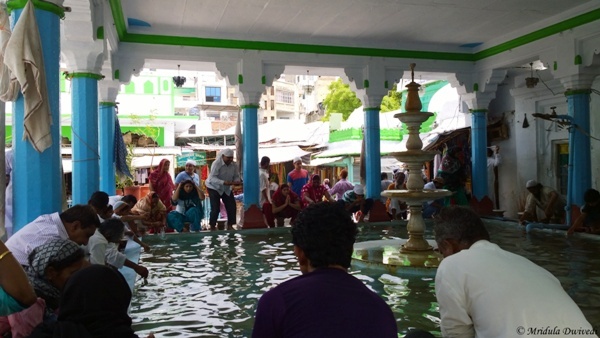 Out of the four times, I visited the dargah thrice. There is something about the place that has a pull. Till now I have refrained from making a mannat even though I do visit the shrine. My argument is that Gods have been kind to me so why ask, they already know what I want. 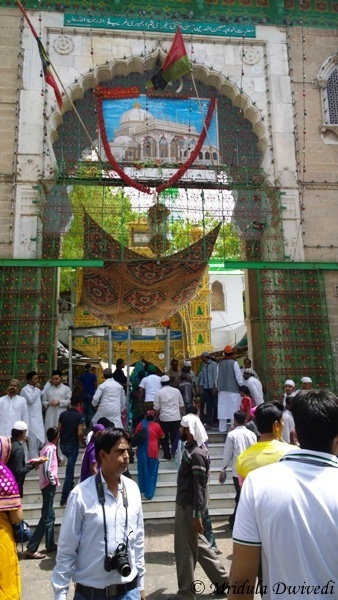 However, it was for the first time I took a video of the narrow lanes of Ajmer leading to the shrine. And as I have an obscenely early morning flight on Thursday to Amman, the war to leave the station has started and so far I seem to be losing it. There are thousand and one things that are pending, which of course includes packing. I hear that wifi is not free at many hotels in Jordan so I am not sure if I will be able to connect from there. But I do assure you that I will bring back a lot of stories and pictures. In the recent days I visited the Brahma Temple at Pushkar, the Ajmer Sharif Dargah and now it is time to attend a mass by Pope at Amman. Even though I have not really probed what kind of faith I have, but the vibes such places are so vibrant. Jordan is the third new country for me this year, Finland and Maldives being the other two. Maybe I should get greedy and ask the Gods to give me a few more countries this year as it is only May till now! 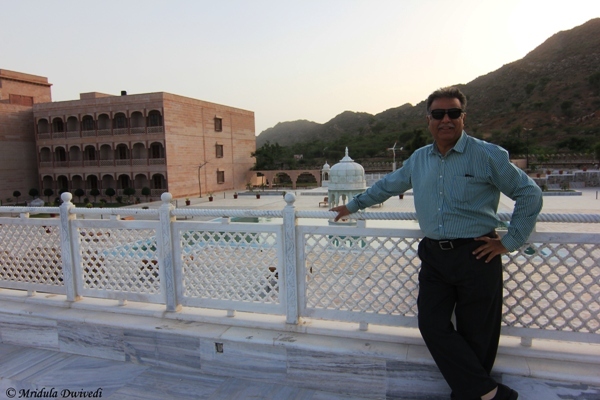 When our driver Rajendra ji pointed out the Pratap Palace, Ajmer in the distance, like true Rajasthani architecture it blended with the surroundings. 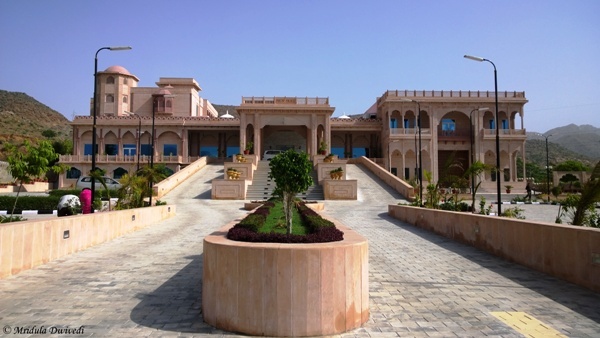 Pratap Palace, Ajmer is a Keys Resort, situated on the Ajmer Pushkar road. 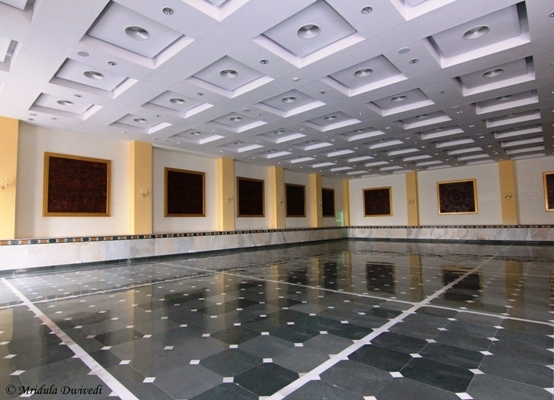 It is surrounded by the Aravalis and away from the hustle and bustle of both the cities. It is a luxury property and I was invited to visit the hotel. After the check in where we were greeted with the traditional tikka and welcome drink. I headed to my room after a quick check-in. I quite liked the idea of the jhula in the room. I am not sure how men folk would react to it but I loved it. The room was big, even bigger than what I am used to in luxury hotels. There was tea in the room, which is the first thing I look for in any room. There are some teething troubles with the TV and some cell phone operators as the hotel is new. But I am sure these things settle down with time. There are 86 rooms in all in the hotel. One entire floor dedicated to suites. Pratap Palace has a beautiful courtyard at the back which has the swimming pool too. Surprisingly for May it was still not too hot in Rajasthan and I went and soaked in the atmosphere for a while. I wanted to go swimming but as there was a dust storm in the morning they had put chemicals in the pool. They advised me not to swim. At the end of the pool a local artist was painting on the wall. 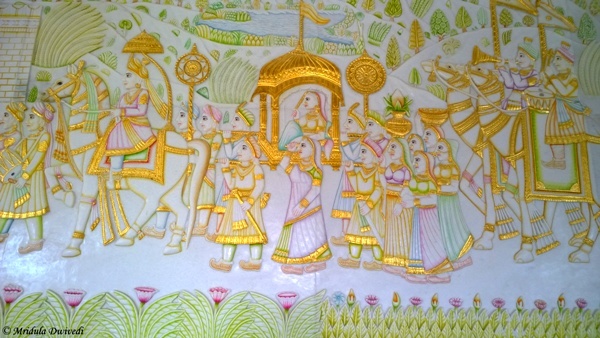 There is a lovely mural on the wall of the main lobby which depicts a large procession. At first glance it looks like a painting but it is carving in marble. I wanted to click a selfie here but missed it somehow. 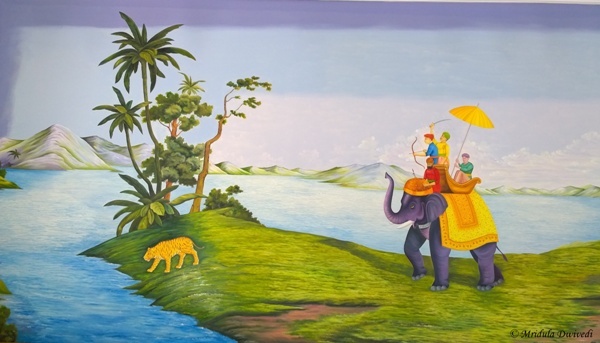 An entire wall in the palace café depicts a wildlife scene. I noticed only later that it depicted a hunting scene. It adds a lot of color to the dining room. The owner of the hotel Mr. Pratap Rangwani was at the premises and he took out some time from his busy schedule to interact with us. I could easily see the passion behind the project. He is from Ajmer though he now lives abroad. He said next time if a dignitary came to Ajmer to visit the dargah they would have a luxury place to stay, and need not go back to Jaipur. 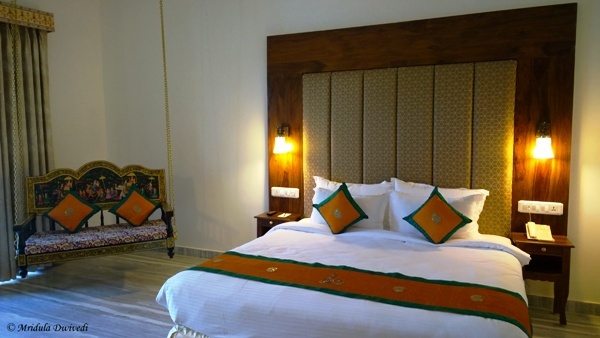 He said the Ajmer Pushkar belt needed a luxury hotel and it was his attempt to fill the gap with the Pratap palace. His staff was also stated that Ajmer is coming up as a wedding destination and the hotel has already organized quite a few wedding. They have a huge banquet hall and an attached garden to it to cater to the wedding and MICE segment. This resort would work for you if you are looking for a relaxed, luxurious place away from the cities. 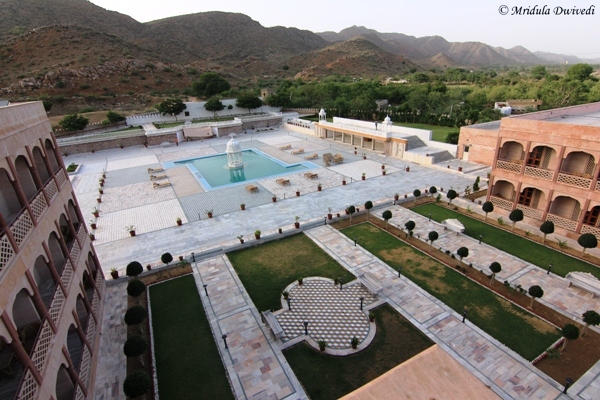 The key attraction the Brahma Temple in Pushkar and the Ajmer Sharif Dargah are in 15 km vicinity of the hotel.